In 1999, Spike Lee decided to direct a film based on a very hard hitting, true story. 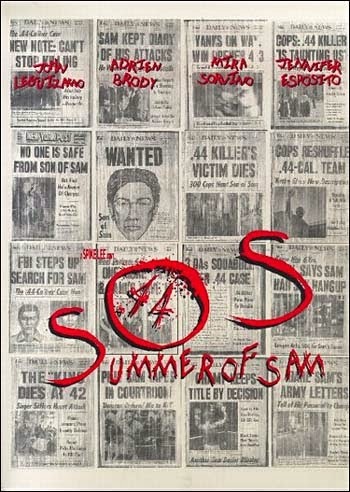 Depicting the events of the Son of Sam serial murders in New York City (summer of 1977), Summer of Sam periodically delves into the search and capture of famed murderer (dubbed the .44 Caliber Killer) David Berkowitz. It also peeks into the lives of the people that inhabit one of the Bronx neighborhoods he was terrorizing. "Sam" carries with it, a majestic sense of time and place. However, it packs in very tightly, too many plot layers to go along with the central story. And the fact that this is all done in almost 2 and a half hours, is a jaw-dropping miracle. Seeing this film for the first time in 5 years, it made me revert back to one of my favorite Spike Lee joints which would be Clockers. With shades of Martin Scorsese's Mean Streets and hints of Saturday Night Fever (especially the overhead shot in "Sam" of the two main characters entering a discotheque), Summer of Sam is similar in structure to Clockers. But it's unable to juggle the plot points effectively like that 1995 film did. The reason: it could be the script which feels too abrasive and without thoughtfulness or ambiguity. Most of the characters talk in a racist manner with huge stereotypes to go along with it. Was that the culture of New Yorkers at the time? I'm not sure because I'm not from NYC and I was only 3 when these events took place. Regardless, this could create a rather large unlikability factor with the audience, an audience who invests their time to view this flick. In essence, Summer of Sam is the epidemy of restless, scatter shot film making. Spike Lee has harbored this style ever since he burst onto the scene with 1986's She's Gotta Have It. Sometimes he gets away with it and sometimes he doesn't. But you can't fault him for directing films that feel alive and have a pulsating sense of urgency. With his "plot over plot over plot" way of doing things, he unfortunately gets a mixed review from me. Bottom line: "Sam" is a mess, but it's an ambitious mess with a couple of really powerful scenes that hint at what a great film this could have been (one of the best sequences is a fantastic montage of sights and sounds accompanied by the tune of The Who's "Baba O' Riley"). With this vehicle, you get a great soundtrack (a mix of classic rock from The Who and disco) and two edgy performances (John Leguizamo as Vinny and Mira Sorvino as Dionna) that highlight the strong points. Also, the appearance of real life columnist Jimmy Breslin (he received letters from the killer and narrates the beginning/ending of the movie) is a nice touch. But like I said earlier, "Sam" tries to include everything. You have plot elements such as the infidelity of Vinny in his marriage to Dionna, the glory of the 1977 New York Yankees, the supposed birth of the punk rock movement, and even the local mob joining the police to find the would be Son of Sam murderer. So OK, let's be honest, Summer of Sam is not that bad of a film. But it's way too cynical and ideological to be great. I'll leave you with this notion: in New York City, the summer of 77' was one of the hottest on record. After viewing Lee's exhausting, profanity laden marathon of a movie, you may feel just lukewarm.